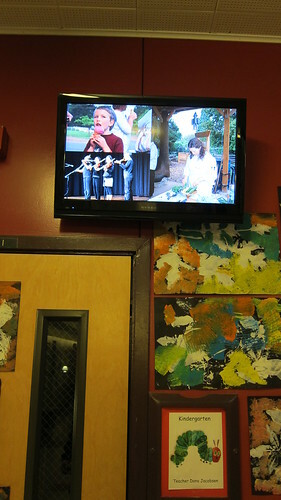 At Lewis Elementary have had a monitor running school images in our hallway near our office. This is a common waiting area and it is a nice opportunity to share images of what is going on with our program with those visiting in this area. To share the images we have used an old laptop connected to a wall mounted monitor to cycle through a series of desktop images. This has worked well for the past few years until recently when the old laptop finally gave out. I have been looking for other solutions, decided to try an AppleTV. The AppleTV allows you to display images from a number of sources including Flickr. So now we have an AppleTV connected to the monitor and are running a slide show of images from our Lewis Elementary Flickr account. In addition the AppleTV also gives us the option of playing music, so we now also play music via the AppleTV along with showing the images.